Shaun Sears, seen here rescuing "Shorty," is a self proclaimed cat lover. When I was a kid I loved to climb trees. I loved the thrill of rising above my yard, entering another world among the branches and peering down at the rooftops in my neighborhood. Inevitably, I gave up scaling trunks of firs in my backyard for more “grown-up” pursuits. Local arborist Tom Otto, however, never did. He made a love of trees, and climbing them, into his profession. Tom Otto, an urban forester for the City of Olympia and founder of Canopy Cat Rescue, can be seen climbing trees to save stranded cats in the new Animal Planet series, “Treetop Cat Rescue” airing Saturdays at 9 p.m. Formerly a City of Olympia park arborist and now the Senior Vegetation Specialist in the Environmental Services department, Otto lives up to his title of Urban Forester. His experience with climbing trees as a certified arborist and a desire to “climb more trees on the side” led him to start Canopy Conservation with his brother-in-law, fellow climber and certified arborist Shaun Sears. The two initially tackled a variety of climbing jobs. “We began working with the Washington Department of Fish and Wildlife in their ‘Watchable Wildlife‘ program installing osprey nesting platforms and wildlife cams,” shares Otto. Canopy Conservation also assesses and trims our towering northwest trees, and to their surprise, began to rescue treed cats. “We ended up on a list of arborists who could rescue cats,” recalls Otto. With Canopy Cat Rescue as one of the only names for the Tacoma/Olympia area, their call volume increased quickly. “We had a flat rate, but ended up getting a lot of calls from people who couldn’t afford it. We always worked with them asking for at least some gas money for the drive,” says Otto. The duo decided to swap to donations only and have been paid with everything from a dozen eggs to several hundred dollars. The “public service” angle caught the media’s attention and after a few news stories, the calls started flooding in. Canopy Cat Rescue was born. Calls came from all over the Puget Sound area and both climbers were surprised by the response. 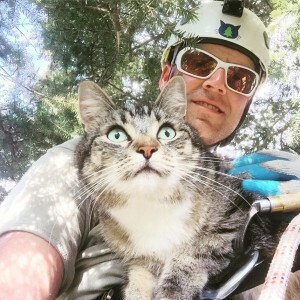 “We would do two or three rescues in a day and as a result began to develop a system of questions to ask them before we headed out – how high is the cat, what kind of tree is it, is your cat friendly, is it on your property,” he shares. And as they became busier each day, the advanced preparation became key. “We didn’t set out to be a cat rescue service, but the more calls we got it became very clear that it was a really needed thing. 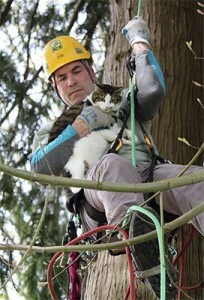 It’s not just every once in a while cats get stuck in trees, it’s a daily occurrence,” Otto explains. And, there are very few people with the climbing and animal skills to handle a cat rescue with the safety and well-being of the cat as priority number one. Shaun Sears, seen here rescuing “Shorty,” is a self proclaimed cat lover. “Tree climbers aren’t always cat people and while I’ve always had cats, I never thought I was a ‘cat person’ before. I feel comfortable in saying I’m now a crazy cat person,” laughs Otto. Canopy Cat Rescue eventually caught the attention of a production company, Pilgrim Studios, the company behind hit shows like Dirty Jobs and Wicked Tuna. “Our niece knew someone at Pilgrim and shared what we were doing at Canopy Cat Rescue. The group loved the idea,” recalls Otto. Pilgrim created a “sizzle reel” – an informal commercial intended to shop a new show idea around to networks and Animal Planet snatched it up, agreeing to pay for two pilot episodes. “Typically during this process, the production company will send the network rough cuts of footage so they can see how things look. Pilgrim sent the rough cuts and Animal Planet called right away and wanted to buy eight more episodes,” recalls Otto. The pair was ecstatic and the Animal Planet show Treetop Cat Rescue was underway. Filming began last fall and wrapped in mid-April. “We thought, ‘great – they are going to follow us around and film cat rescues’ but we weren’t prepared for the amount of time needed for filming,” shares Otto remembering the 12 hour days with the film crew. A typical rescue for Sears and Otto would take anywhere from 15 minutes to over two hours, but with filming, rescues took a minimum of three hours. The pre-interviews, post-interviews, and securing a camera crew in the tree prior to filming all took time. 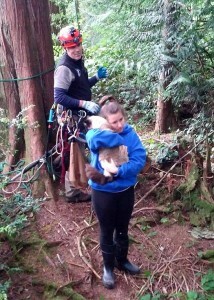 Canopy Cat Rescue’s Tom Otto reunites a lost cat with his very grateful owner in a wooded area of Olympia. The “docu-follow” reality show premiers on Saturday, May 30 at 9:00 p.m. on Animal Planet with back-to-back double episodes featuring a variety of rescues throughout the Puget Sound area. In future episodes, look for an educational visit to Boston Harbor Elementary School where Otto’s daughter Greta is a fourth grader as well as a segment with Thurston County Animal Services where Tom and Shaun bring in strays and pick up donations of crates from the local non-profit who has been endlessly supportive of their work. To date, Canopy Cat Rescue has saved over 500 cats from the tall trees of the Northwest and reunited countless families with their beloved pets. You can see rescue videos and photos on their Facebook Page and find all the information to contact Shaun and Tom through their website where they also accept donations to help support the service they provide. Their non-profit status is in the works and should be official soon. Tune in on Saturday night to catch a glimpse into that treetop world that so many of us remember from our childhoods through the eyes of two dedicated arborists and cat lovers and through the eyes of the grateful felines they rescue. Got a cat stuck in a tree? Call Canopy Cat Rescue at 877-721-MEOW. You can also contact them via email at canopycatrescue@gmail.com.